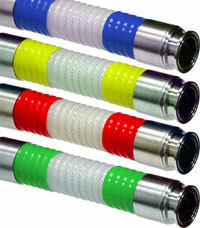 Brightly colored silicone bands can be used to easily identify hoses for specific destinations and applications. Bands are applied at each end when hose fitting is crimped, making a secure and easily cleaned color cuff. The silicone cuffs can perform in most service applications including SIP, CIP, and autoclaving. Sani-tech West stocks a variety of colors and can even special order specific colors for your needs.